Skoot Rodent Repellent is an effective method for repelling vandalizing varmints, i.e. mice and rabbits. 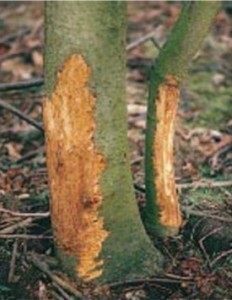 The most obvious damage is the stripping of bark at the base of plants. Severe girdling all around the stem will kill plants. “Skoot Rodent Repellent” is a distasteful liquid that is sprayed on the lower trunk region. 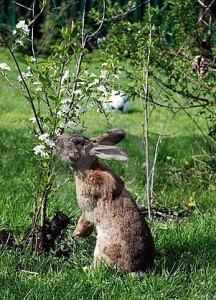 Skoot will not harm the animals or plants, it merely acts as a deterrent, just like garlic does with cats. Skoot is applied before snowfall and will repel for up to one half of a year.